A constant drip from one of your faucets may simply indicate the need to replace the washer. If this is the case, you can shut off the water, unscrew the handle, and inspect the washer and O-ring for damage. If you replace the washer and the drip continues, you should call a plumber, as you may be dealing with loose parts or broken plumbing components. 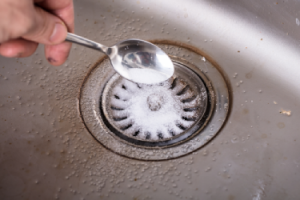 Clogged drains can often be freed up with simple solutions of salt or baking soda and hot water. You can also try using detergent designed for washing dishes by hand: place a good portion of detergent down the drain and then flush hot water after it to allow the soapy mixture to unclog the drain. For tough clogs, store-bought formulas may be necessary. Certain clogs are lodged so deep within the pipes that solvents of any kind–including those containing chemicals–are simply not strong enough to break them up. If this is the case, a licensed plumber in Laguna Niguel should be contacted without delay. If you notice that water continues to run after you flush the commode, the chain within the tank may have become separated from the lever. If this is the problem, you will likely find the chain in a small pile on the bottom of the tank and you can simply re-attach it to the flushing handle. If the chain is damaged, however, it should be replaced. Not all toilet repairs make good DIY projects. For example, a constantly leaking or overflowing toilet is not a repair you should attempt without assistance. Similarly, if your toilet’s water supply is suddenly not strong enough, a plumber should be contacted to determine the reason. Finally, if raw sewage ever begins backing up into your toilet or bathtub, a plumber should be called to your home immediately. If your shower head sprays water at odd angles or seems to have a strong flow from one part of the shower head while only coming out at a trickle in another, you may have a buildup of lime scale on the spray plate or shower head. Fortunately, these components can be soaked in a descaling solution, which should eliminate the problem. However, if the water pressure itself seems to increase and decrease at odd intervals, a plumber should evaluate the unit. If your water heater is making an odd sound, emitting a strange odor, or otherwise performing improperly, contact a professional to evaluate the unit. Whether the water heater is tankless, electric or gas, water heater repairs are not generally good DIY projects. Whenever you are in doubt about any repair, always err on the side of caution and contact a professional plumber.